Heavenly blog! : Nr. 519: By looking at the history and the Jews, we Jews learn better knowing. Ourselves and God! Nr. 519: By looking at the history and the Jews, we Jews learn better knowing. Ourselves and God! By looking at the history and the Jews, we Jews learn better knowing. Ourselves and God! A film or documentary film that affected me a lot was the documentary BBC2 sent 1 June 2013 called Love in the shadow of Hitler, here is the couple's documentary mostly about. The German soldier Helmuth and Jutta and her Jewish famille. The year is 1938. 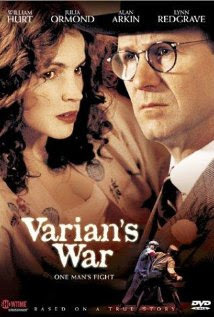 Varian Fry, an American journalist, is in the middle of Hitler's war-torn Germany. Here he witnessed the dictator's violent forward momentum in the streets of Berlin. Back in New York is the first no one believes what he says, but little by little he wins the trust of a group of unexpected allies. In 1940, Fry comes to France with an American aid organization, a list of 200 names and a thoroughly prepared escape plan. Using illegal, dangerous and will hopefully successful methods: Can a man save thousands of refugees from torture and death before he is discovered? Form I this is both informative, some entertainment and a small hobby to get a little insight into Jewish history. Also recommend books and other literature so off we both can understand better Jews, better ourselves and through that, I think we learn to know God better. That he, in spite of their great betrayal against him by rejecting his Son Jesus Christ. So he has promised to be with them, even until the end. Yes as long as the world endures. Jer 31:37 Thus saith the Lord: If the heavens above can be measured, and the foundations out beneath, I will also cast off all the seed of Israel for all that they have done, saith the Lord.